I know what you’re thinking: “Clean and jerks? For a bodybuilder?” Rest assured, the “jerk” part of this workout has always been generously defined. Clean and presses or push-presses are just fine. Heck, when Bodybuilding.com athlete Laurence Ballenger did Grace as part of the Brute Showdown competition, he basically did upright rows and push-presses. So, do what you can, as long as it’s safe. No matter how you do it, the clean and jerk, or press, is truly a full-body movement, and a great way to either start your shoulder routine as a pre-exhaust, or to finish off your delts (and lungs) at the end. The prescribed weight for Grace is 135 pounds for men and 95 pounds for women, but don’t let that standard guide you. If you choose to go light, try to do all 30 reps in a row. If you’d rather work for power, go a bit heavier and take short breaks when you feel it’s necessary. Just remember that the clock is always ticking, so don’t let your time off get carried away. With a barbell on the floor close to the shins, take an overhand or hook grip just outside the legs. 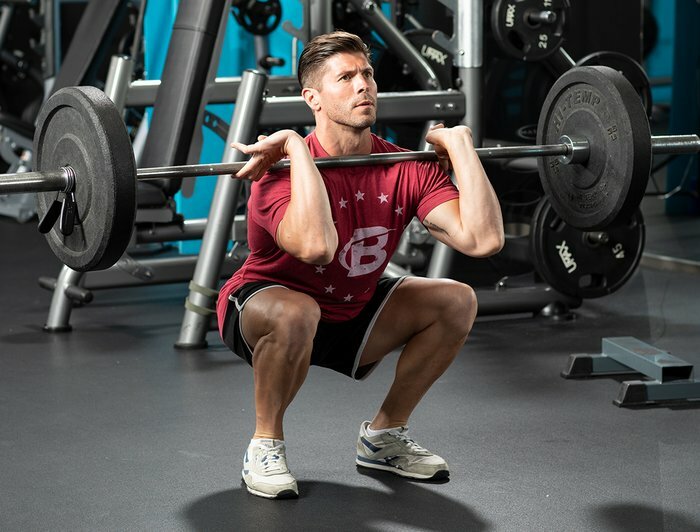 Lower your hips with the weight focused on the heels, back straight, head facing forward, chest up, with your shoulders just in front of the bar. This will be your starting position. Next comes the second pull, the main source of acceleration for the clean. As the bar approaches the mid-thigh position, begin extending through the hips. In a jumping motion, accelerate by extending the hips, knees, and ankles, using speed to move the bar upward. There should be no need to actively pull through the arms to accelerate the weight; at the end of the second pull, the body should be fully extended, leaning slightly back, with the arms still extended. As full extension is achieved, transition into the third pull by aggressively shrugging and flexing the arms with the elbows up and out. At peak extension, aggressively pull yourself down, rotating your elbows under the bar as you do so. Receive the bar in a front squat position, the depth of which is dependent upon the height of the bar at the end of the third pull. The bar should be racked onto the protracted shoulders, lightly touching the throat with the hands relaxed. Continue to descend to the bottom squat position, which will help in the recovery. Immediately recover by driving through the heels, keeping the torso upright and elbows up. Continue until you have risen to a standing position. The second phase is the jerk, which raises the weight overhead. Standing with the weight racked on the front of the shoulders, begin with the dip. With your feet directly under your hips, flex the knees without moving the hips backward. Go down only slightly, and reverse direction as powerfully as possible. Drive through the heels create as much speed and force as possible, and be sure to move your head out of the way as the bar leaves the shoulders. At this moment as the feet leave the floor, the feet must be placed into the receiving position as quickly as possible. In the brief moment the feet are not actively driving against the platform, the athletes effort to push the bar up will drive them down. The feet should be split, with one foot forward, and one foot back. Receive the bar with the arms locked out overhead. Return to a standing position.